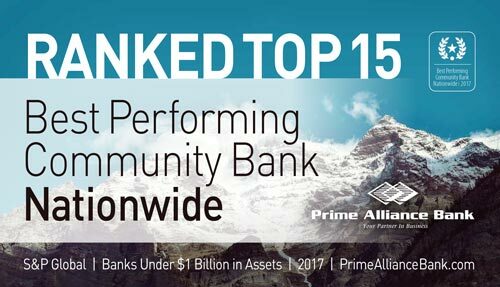 SALT LAKE CITY, April 11, 2018 - Prime Alliance Bank, located in Woods Cross, Utah, soared to the top of S&P Global Market Intelligence’s 2017 ranking of the best-performing community banks under $1 billion in assets. To compile this ranking, S&P Global Market Intelligence calculated scores for each company based on six metrics: pretax return on tangible common equity; net charge-offs as a percentage of average loans; efficiency ratio; adjusted Texas ratio; net interest margin; and loan growth. Based on the above metrics and other criteria in the report, 4,383 banks and thrifts were eligible for the ranking. Prime Alliance ranked 15th on the list of national banks with $304.8 million in total assets, a 24 percent loan growth rate and overall efficiency ratio of 31.86 percent. Prime Alliance Bank has been an asset to the community since it opened in 2004. Specializing in equipment lease financing, the bank offers leasing solutions that can help a company acquire more equipment without the burdens of ownership. From reducing debt loads and improving balance sheets to lowering tax bills, leasing offers a different type of financing that can positively affect the overall operation of a business. Prime Alliance was built on the premise and understanding that customers value the personalized attention and care that comes from dealing directly with an experienced and knowledgeable banking professional who can help them achieve their financial goals. Prime Alliance Bank began in 2004 and offers a wide variety of deposit and lending products which suit the needs of business and personal customers — with a specialized focus on business banking solutions. Products and services include online banking, cash management, bill pay, low-cost business checking accounts, remote deposit, mobile banking, sweep accounts and competitive rates on commercial loans, leases and SBA lending. A combination of personalized attention and care, coupled with emerging banking technology, allows Prime Alliance to serve a specialized combination of high-tech banking coupled with friendly, local service.